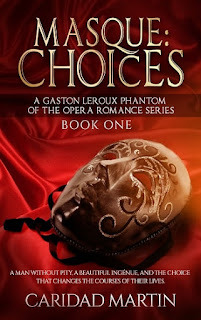 Today we are interviewing Caridad Martin, author of the gothic romance "Masque: Choices" (A Gaston Leroux Phantom of the Opera Romance Series). I was born in Cuba and grew up in the Bronx in New York City. I began to write poetry when I was seven. While I was high school, I had two interests, sports and writing. I wrote several apocalyptic based short stories. I graduated from The City College of NY with a degree in creative writing, I but did not pursue writing as a career. Instead, I travelled extensively throughout the US, Europe and Latin America. I got married and lived in Colchester, England for a few years. We moved back to the US and I had a child and wrote several fiction pieces which again, I stored away. I became an educator and taught bilingual students as well as special education students. As a staff developer I have published several articles on the use of technology in education. Aside from writing, I coach teachers to improve their teaching skills. In 2005, I saw the 2004 movie version of the Phantom of the Opera. I loved the movie so much that next day bought a copy and purchased tickets for the Broadway show ― I was hooked! The story fascinated me and I wanted more. I purchased most of the books available at the time and eventually discovered fan-fiction online. After a few months of reading, I submitted a short, short story. It was well received and I wrote a longer one. I began to write regularly and realized that there were readers that really liked my writing style. Around 2008, I went through a period of emotional turmoil due to my mother’s declining health. I filled notebook after notebook as I sat in the waiting room of a number of hospitals. After I left New York City and went to live across the river in Jersey City, I continued writing. The calm of this smaller city settled my mind enough to take my writing to the next level and publish. Erik is dying. Not once in his life has anyone ever loved him, not even his mother. Every day his heart fails him more and he is desperate not to die alone. He hides his face and past sins behind a mask. Erik is dying and has fallen desperately, obsessively in love. Christine Daaé, a rising star at the Paris Opéra is kidnapped by Erik, her voice tutor. When her childhood sweetheart attempts to rescue her, he gets trapped in Erik’s torture chamber. Erik gives her a choice, marry him or watch her lover die an agonizing death. Defeated, she agrees to the marriage in name only. Erik finally has the companion he has always dreamed of, he cannot hope for more…but he does. His heart, though failing, dreams of romance and love. Though he yearns for her love and lusts after her body, Erik knows they’re forbidden fruit for someone like him. Christine is determined to honor her marriage vows, though she’ll love Raoul forever. But, the more time she spends with her husband, the more she’s drawn to him, falling under the spell of his music and the tender wounded soul he desperately tries to hide behind his mask. Erik finds his mask cannot protect his heart from the anguish of unrequited love, his obsession for her, spirals out of control. His passion for Christine has brought him to the brink of insanity and threatens to destroy them both. 18+ Men and women who like the story of the Phantom of the Opera, Beauty and the Beast and readers of gothic romance. 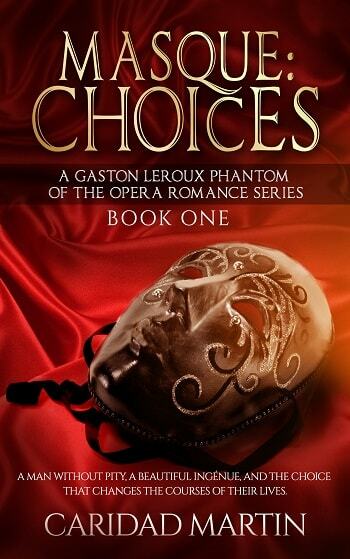 What inspired you to write a gothic romance with the “Phantom of the Opera” characters? Our society today is so obsessed with the concept of beauty, that the idea that a protagonist that is totally hideous could be loved, was a challenge I wanted to tackle. In the original story written by Gaston Leroux in 1910, the character of Erik is born physically hideous. He becomes mentally unstable when the world rejects him, he is also known to have been an assassin for the Shah while in Persia. I wanted to make this character human. In my version of the story, the character of “Erik” has two redeeming characteristics he is a musical genius and he loves selflessly. How did you capture the style of the Gothic romance with your writing style? Erik lives in a house that is in a dark, gloomy mysterious place with secret tunnels and pathways. Christine is naïve, eager to please and an orphan, making her seemingly powerless. Erik’s personality at first is cold and reserved which is typical of a gothic romance protagonist. Erik is commanding and holds sway over the entire opera house. However, there are other unnatural forces Erik must gain control over or lose every thing. In the story, the Persian acquiesces to Erik’s request to help him marrying Christine. Why does he do this? Many of the Phantom of the Opera rewrites, including the Broadway show, leave out the Persian. I have named him Hafiz and made him a central character. Thanks to his willingness to help the plot events can move along. When Erik comes to him for help with the marriage, he doesn’t want to help him. The Persian knows that Erik suffers from a heart condition. He and Erik both believe that Erik will die soon. Erik convinces the Persian that he will leave all his worldly possessions to his new wife. The Persian knows Erik has been rejected by society all his life and as an act of kindness he agrees to help since the marriage will last only a short time. Christine, despite being forced into marrying Erik, seems to empathize with him. Without giving too much away, can you tell us a bit about the emotions she experiences? She is grateful to him because through his tutoring of her voice she has become an amazing singer. Christine has always been loved and is herself a very loving person. After she sees Erik’s face she pities him deeply. As she gets to know him, she sees not just the teacher and the monster, but the man he has always hidden. What makes your gothic romance story stand out from other books in the genre? The story has gone through several editors and is professionally formatted. My story, set in 1880, is a continuation of Leroux’s novel, had Erik made a different choice and not let Christine go. I notice that lately the trend is to have Erik meet a woman other than Christine, but I prefer the original Erik/Christine combination. Christine is often criticized for being immature and selfish. At age twenty, I can’t say I was paragon of maturity. I enjoyed writing “Erik” because he is such a complex character and his life story is so compelling. As the story develops his character develops, but not in a linear fashion. My writing process is eclectic. I start with a general idea for story I want to tell. For Masque, I did months of historical research on France, the Paris Ópera and the French aristocracy during the period around 1880. It helped that I’ve been there several times. Getting the fact accurately is essential to me. Once I have the time period solidly in my head I can begin to develop the storyline. I envision a scene at a climatic point in the story. The character talks to each other during this scene. This will determine what is going to happen in the scene. For draft one I never outline the story since the characters dictate where the story should go by their interactions. I just write and let them talk to each other. I write several scenes just using dialogue without regard for their connectivity. 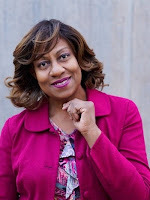 During the second draft I begin to connect the scenes and to include detailed descriptions of the characters and their surroundings. As the grouped scenes fall into natural blocks of time or events, I separate them into chapters. The third draft consists of taking out irrelevant scenes, changing dialogue, checking for POV discrepancies bringing in a character or removing one and using flashbacks to fill in vital information. At this point I will leave the story alone for a while and take care of the rest of my life. Then begin my editing process. After I make corrections I send it out to a copy editor make those corrections and eventually the novel is sent to a proofreader. Masque went through seven full edits before I send it out to a developmental editor. At this stage the book had grown to about eight hundred pages. The editor suggested I break it down into more manageable sections. After arguing with editor I finally saw his wisdom and decided to make Masque a series. The print version of Masque: Choices Book one, is just over three hundred pages, which was practicable for me. I love the idea of being able to “carry” a plethora of books with me where ever I go. I make up my mind what I want to read on the way. E-books have revolutionized the industry. I know that many people complain that the quality of books has gone down. There have always been awful books, books that should have never been printed―weed them out yourself. Physical books have their place as well and that is why I will make my series available in paperback before the end of 2015. Without giving too much away, what can you tell us about the next book in the series? Masque: Forge, Book two is published and currently available on Amazon. The storyline continues and explores the possibility that Erik and Christine’s marriage may have crossed too many bridges to be saved. There are changes that both Erik and Christine must make if they are to forge a new relationship. Will they be able to make those changes in time to save their marriage? Book three, Masque: LeBeque, is still in the works for fall 2015. All my characters are flawed in some way and some of them grow and change, but not always for the best. I hope that readers will fall in love with Erik and Christine’s love story. Erik paced the small living room in Hafiz's home. “Stop it. You will wear out my carpets. And don't think I will not charge you,” the Persian said. Erik stopped in front of Hafiz. “Daroga, she kissed me!” he exploded. The Persian looked perplexed. The Persian quirked a scraggly eyebrow. “If I accede, Allah will call me on this,” Hafiz said, more to himself than in answer to Erik. Where to buy "Masque: Choices"